Manchester City booked their place in the fifth round of the FA Cup in emphatic fashion as they thumped Sean Dyche’s Burnley 5-0. The Blues opened the scoring in the first half through Gabriel Jesus as the Brazilian international skipped his way past three Burnley defenders and smashed past Nick Pope to give his side a deserved lead. The hammering win means City have hit a staggering 26 goals in six games and recorded eight victories in their last eight games. Despite City’s dominance the Clarets did manage to contain the Premier League Champions and made sure they went into the break with just the one-goal lead. In spite of this, their containment was short lived after the restart as City found the net four times in the second period through Bernardo Silva, Kevin De Bruyne, a Kevin Long own goal and a Sergio Aguero penalty. Inevitably it was the home side who started the stronger of the two teams and they nearly had the lead through Bernardo Silva twice in a matter of minutes. His first opportunity was put on a plate by Kyle Walker as the England full-back pulled the ball back for Silva who hit an effort from 10 yards straight at Pope. Moments later the Burnley shot-stopper denied the Portuguese international again as he brilliantly tipped over a Silva effort from the edge of the box. The hosts had found the net 12 times in the previous three meetings between the two sides at the Etihad Stadium, so it was only a matter of time before they found the net in this one, and this eventually came just after the 20-minute mark. Left back, Danilo found his international teammate, Jesus and the City frontman turned on his Brazilian style as he neatly wriggled away from three defenders and smashed a fierce effort past Pope to give his side the lead. 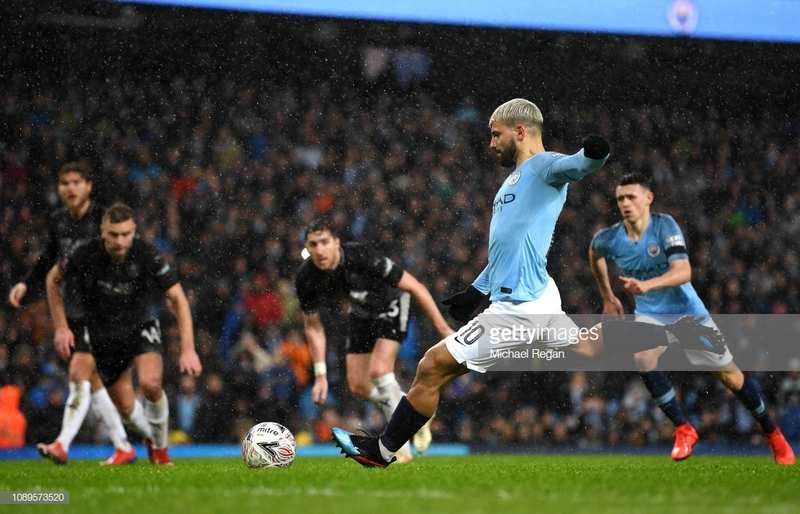 The Champions continued to dominate in the wet and windy Manchester conditions and came close to a second as De Bruyne played a chipped ball into Ilkay Gundogan, however, the ball was just too heavy, and it evaded the German international and fell into the grateful hands of Pope. Gundogan again looked to cause the Clarets problems as he broke free in behind the Burnley backline, however, James Tarkowski was on hand to deny the German with a well-timed, last ditched challenge. Into the second half and it was Burnley who started the brighter, so bright in fact that just minutes after the restart they could have, and probably should have been on level terms. Matej Vydra capitalised on a poor pass from Nicolas Otamendi and broke through, one-on-one from Ederson. Despite this, the Czech striker couldn’t capitalise on the defensive mistake as he put his unchallenged effort into the side netting. Dyche's side would live to rue Vydra’s miss as moments later City had their second. De Bruyne slotted a through ball to Bernardo Silva who despite being denied twice in the first half by Pope finally beat the Burnley keeper, as his deflected effort found the back of the net. Minutes later things went from bad to worse for the Clarets as De Bruyne swapped his provider role for finisher. The Belgian found space 25 yards from goal and hit an unstoppable effort past the helpless Pope in vintage De Bruyne fashion. With 20 minutes still left on the clock, it was set to be a long final 20 for the visitors as City hit a fourth. Bernardo Silva played in De Bruyne, whose fierce low cross crashed off Long and into the empty Burnley net. After putting into his own net, Long’s afternoon got even worse with five minutes left after his pull on David Silva in the area gave the referee no option but to point to the spot. The ever-reliable Aguero stepped up and calmly slotted home to send City into the fifth round in impressive fashion. City's five goals today means they have netted 26 times in just six games, and 13 in their two FA Cup clashes this season after they defeated Rotherham United 7-0 in the previous round at the beginning of January. After an injury-ridden first half of the season, City playmaker, De Bruyne looks to be back to his unstoppable best with two assists and a superb goal in the win. Perfect timing for Pep Guardiola and his side as they head into the business end of the season. Despite the battering, the result is not as bad as it looks for the Clarets as not many teams would have been able to keep out City's sublime attack. Dyche's side had gone five games unbeaten before today showing there is no need for the Burnley faithful to worry.